Beertown was the name given to a five-block stretch of Fulton Street, which started in the 1870s with watering holes servicing patrons of the Bay District Racetrack. San Francisco's gold rush origins are colored by tales of a wild frontier town, where hard drinking and loose living were the norm and civility seemed to be the exception. Names like the Barbary Coast and the Tenderloin evoke part of the legacy. The western neighborhoods also had a milder concentration of "dens of iniquity" during the frontier days. It was called Beer Town, and though it was pretty lively for forty years, it has disappeared with hardly a trace. 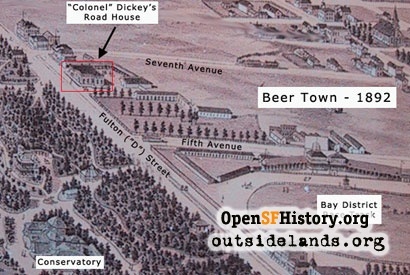 Beer Town was the name given to a five-block stretch of Fulton Street, which started in the 1870s with watering holes servicing patrons of the Bay District Race Track (1875-1896). The horse-racing track covered approximately fifteen blocks of the inner Richmond District from First Avenue (Arguello Boulevard after 1909) to Fifth Avenue, and "A" Street (Anza after 1909) to "D" Street (called Fulton Street after 1895). 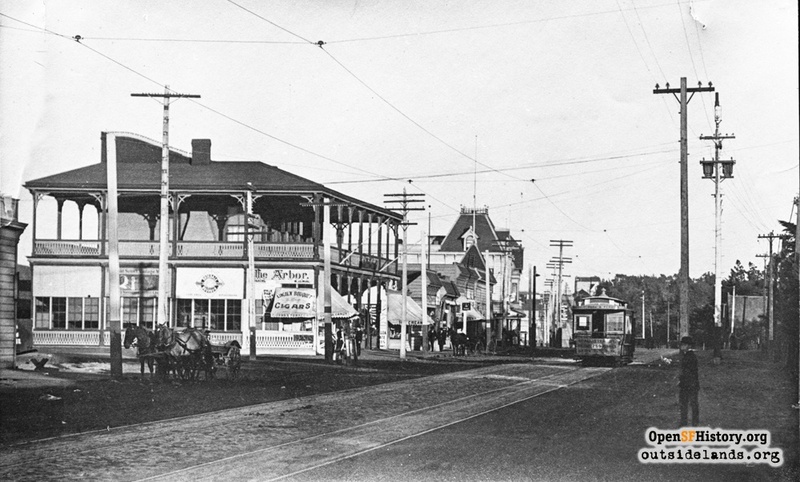 There were a couple of saloons at the corner of First Avenue and "D", west of the Odd Fellows and Masonic cemeteries, and roadhouses further out "D" Street, but Beer Town started across from the race track grandstands that were on the east side of Fifth Avenue near "D" Street and would eventually run to Tenth Avenue. From its inception, the Bay District Race Track was very popular, and huge sums were wagered on some of the finest horses in the region. Public transportation to the race track was by the Geary Street, Park and Ocean Railroad, which ran a steam train from Presidio Avenue along Point Lobos Avenue (now Geary), then south on First Avenue, turning west onto "D" and terminating at the corner of Fifth Avenue (1879 -1892). By 1892, the steam dummy was replaced by a cable line that extended the route along Point Lobos Avenue and turned up Fifth Avenue in front of the grand stand, terminating at "D" street. 3 Near the grand stand stood the Jockey Club, which catered to the refreshment needs of the sporting crowd. The Midwinter Exposition opened on January 27, 1894, and two weeks later the third cable line, the Market Street Railway Co., continued the Sacramento Street line from Walnut Avenue, crossing First Avenue to Lake Street, and then bringing passengers up Sixth Avenue to "D". 7 The north side of the Fair Grounds would now be served by three cable lines emanating from Fifth Avenue, Sixth Avenue and along "D", plus a steam train on Seventh Avenue. With the opening of the Exposition came serious suds. There were beer gardens on the fair grounds in Golden Gate Park, and plenty of liquid refreshments were available at the transit stops outside the park. On the west side of Seventh Avenue alone, there were seven saloons packed next to each other for half a block north of "D" Street. 8 There were an equal number of liquor-selling establishments spaced along "D" Street from Fifth to Eighth Avenue. The Examiner editorial from three months earlier had not been heeded. Beer Town had arrived. On May 1896, the last race was run at Bay District Race Track, and horse racing was shifted to a new track built out in the Ingleside area. The closing of the track would not greatly diminish traffic to the area, but it did slightly change the draw to other entertainment. The Jockey Club building was moved from Fifth Avenue to the northeast corner of Fulton and Ninth Avenue 9, shifting the drinking establishments another block further west. The count of forty-four "groggeries" cited by the Chronicle might have been a wee bit exaggerated. A close examination of the 1898-1899 Sanborn Insurance Underwriters' Map of the area shows only about a third of that number, and the city directory only lists nine liquor establishments in those five blocks. Beer Town was never popular with the Richmond District improvement clubs, whose members conceived of the area as a strictly residential district. The strip of saloons along Fulton and its intersecting avenues was considered a blight. Though it was tolerated in the early years, the improvement clubs grew more vocal against the abundance of saloons as time went on and home development increased. But the area adjacent to Golden Gate Park remained popular for recreation. In 1901, a fifty-room hotel called The Richmond, complete with bar, was built on the northwest corner of Fulton and Ninth Avenue. In 1903, the Chutes, a popular amusement park from Haight Street, lost its lease and relocated in the block of Fulton, "C" Street, Tenth and Eleventh Avenues, with a huge auditorium that seated 3,000 across the street on the southeast corner of Tenth Avenue and "C" Street. Although the Chutes consisted of wholesome family entertainment, it still drew crowds who could support the saloons nearby and perpetuate the image of it being a rowdy area. The neighborhood improvement clubs were too busy dealing with issues of city services, sidewalks, street grading and transportation in the expanding Avenues to do much more than grumble about this enclave of entertainment in their midst. The entertainment row along Fulton Street flourished until the 1906 earthquake and fire gave the catalyst for change. Almost all of downtown was destroyed. After the catastrophe, entertainment venues moved west, out of the fire zone. 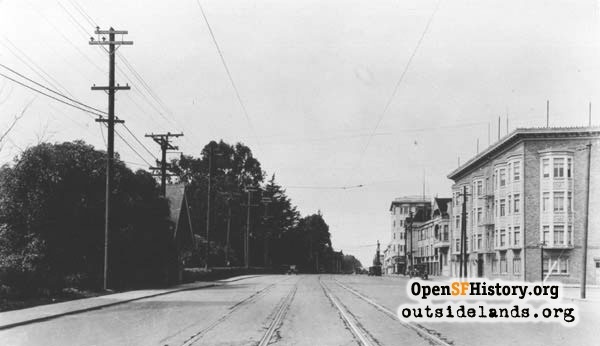 Fillmore Street became very active for commercial and entertainment purposes, but Beer Town took on a lively air, too. The Chutes was packed with merrymakers from the time it reopened on May 20th. All the downtown theaters had burned, so the Orpheum Theatre contracted to conduct its vaudeville performances at the Chutes Theatre for nine months until a new building could be built in the Fillmore neighborhood. In September 1906, the San Francisco Call started a campaign against the sin and corruption in this "new" San Francisco. The fire's destruction of the Barbary Coast and the Tenderloin had caused the gamblers and prostitutes to scatter and find quarters "in the midst of respectability" as the Call termed it. 11 In the exposé, the Call cited a number of residential areas of the city where illicit behavior flourished. It even listed the names and addresses of women living at three "disreputable houses" along Fulton Street in the heart of Beer Town. The Richmond Banner applauded the campaign, saying that the Point Lobos Improvement Club would send a thank-you letter "to the Daily Call for taking the stand against the location of houses of ill-fame in the district." 12 The police and community pressure soon had the effect of turning on the lights and watching the cockroaches scatter. The "disreputable houses" disappeared from Beer Town, but the area stayed popular for other recreation. More respectable entertainment was first brought to the area with the Orpheum's use of the Chutes Theatre for vaudeville. When the New Orpheum moved to Ellis Street near Fillmore, the Chutes kicked off a grand reopening with a lively vaudeville evening on January 21, featuring, among others, Al Jolson doing his black-face act. 13 By February 1907, the Chutes joined the post-quake mania for roller skating, and optimistically opened a 35,000 square foot rink on the northeast corner of Tenth Avenue and Fulton Street. 14 In March, the opera opened its spring season at the Chutes Theatre. The Chronicle reviewer described the Theatre as "only a few degrees better than a circus tent" and complained further that Wallace the lion could be heard occasionally roaring in the nearby Chutes zoo. 15 Despite the attempts by the Chutes to raise the level of entertainment in the area, events beyond their control would doom their plans. A very bitter and violent strike of the streetcar workers started in May 1907, paralyzing the city's transportation system for four months. Getting to work was problematic for many, who had to decide whether they would ride the "scab cars" run by the local transportation monopoly, the United Railroad. Traveling way out as far as the Chutes, only to be stranded because no streetcar would be available, was more than most people would risk. Through the summer of 1907, Beer Town became Ghost Town. In September, the Milan Opera Company's effort to bring higher culture to the Chutes Theatre was poorly attended. 16 By October, the Chutes closed the only zoo in the city and sold off the animals to a zoo in Vancouver. 17 By November, the Chutes closed the main waterslide, roller-coaster and arcade attractions and leased the theater for school or charity productions. An event occurred in November 1907 in another part of town that would further hasten the demise of Beer Town. On the Saturday before Thanksgiving, Coney Island Park, a new amusement venue, opened on Fillmore Street between Turk and Eddy. This was more than just a rival to the Chutes. Fillmore and the adjoining streets had become the center of entertainment in post-quake San Francisco. The most wildly popular nickelodeons in town could be found there, as well as legitimate theaters, roller-rinks, dance halls and saloons. Beer Town had been upstaged by a more centrally located entertainment district. The driving force behind this neighborhood did not consist of improvement clubs seeking to build a residential identity. The Fillmore Merchant's Association was dedicated to bringing in customers to purchase goods and spend money to be entertained. The neighborhood improvement clubs had their wishes granted. Today, not only are there no saloons in the former Beer Town area, the entire length of Fulton Street facing Golden Gate Park is not zoned for bars or restaurants. The only remnant of that time which remains is the "waiting" shelter on the Golden Gate Park side of Fulton Street, facing Seventh Avenue. The shelter once overlooked all of the action in Beer Town, but it now sits looking at "first-class apartment houses or private residences." 1. San Francisco Call, May 7, 1901. 2. Mathew Brady, "This Old Town", San Francisco Independent, March 19, 1996. 3. Walter Rice and Emiliano Echeverria, When Steam Ran on the Streets of San Francisco, p. 58. 4. Rice & Echeverria, p. 45. 5. Rice & Echeverria, p. 58. 6. San Francisco Examiner, October 23, 1893. 7. Rice & Echeverria, p. 45. 8. San Francisco City Directory, 1894. 9. San Francisco Chronicle, January 25, 1914. 10. San Francisco Chronicle, June 9, 1898. 11. San Francisco Call, September 16, 1906. 12. The Richmond Banner, September 21, 1906. 13. San Francisco Chronicle, January 21, 1907. 14. San Francisco Call, October 21, 1906. 15. San Francisco Chronicle, March 23, 1907. 16. San Francisco Call, October 7, 1907. 17. San Francisco Call, October 20, 1907. 18. The Richmond Banner, June 18, 1909. 19. The Richmond Banner, May 3, 1912. 20. San Francisco Chronicle, January 25, 1914. Page launched 25 October 2006. Ostriches at San Francisco's Ocean Beach?